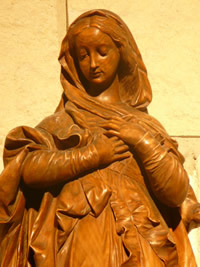 Statue of the Blessed Virgin Mary in the Abbey Church. According to the Rule of St. Benedict, a person with a vocation to the monastic life must be one who truly seeks God through a life of prayer and who desires to practice obedience and undergo trials in his quest for God (cf. RB 68). In his prayer life the monk seeks to respond to the Word of God by giving Him praise, asking for grace, interceding for others, and offering thanks. The monk’s obedience is another form of listening to God’s Word as it is expressed in the concrete will of the abbot and the needs and challenges of the community. Knowing that he is a sinner in a fallen world, the monk accepts all trials as a way of drawing closer to our Lord, who goes before us all on the way of the cross. The monastery is a “school for the Lord’s service” (RB Prologue) in which prayer, obedience, and the blessings of community life pave the way to an ever-deepening love for God and our fellow human beings. Br. Ignatius is received into the community of the solemnly professed with a blessing from each father. Today we are blessed to have several young men at Our Lady of Dallas in different stages of the formation process. Besides living the monastic life as temporarily professed members, they are studying at various universities, both here in the Dallas/Fort-Worth area and in Rome, and some are teaching in the Cistercian Preparatory School. For more information about the formation process, please visit the above links about the novitiate and juniorate, as well as the links to more information on the monastic life of prayer, study and work. For further guidance in discerning and nurturing a vocation, please read If Today You Hear His Voice, a guide to vocations written by the Abbey’s former novice master, Fr. Roch Kereszty. For information on vocation retreats in the Abbey, you may call, e-mail, or write to the Abbey’s vocation director, Fr. Thomas Esposito (972-438-2044, ext. 5271). 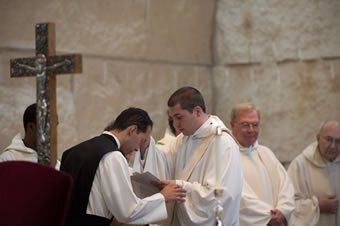 Please keep all of our young brothers in your prayers as they persevere in their vocations.